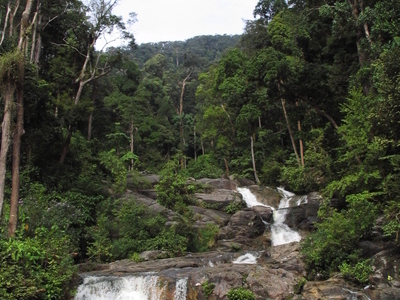 Mount Ophir, or more commonly known by its Malay name, Gunung Ledang, is a mountain situated in the Gunung Ledang National Park located in Ledang District (northwestern Johor), Malaysia. The summit is located between the border of Muar and Malacca. Standing at 1,276 m (4,186 ft), with a clear trail leading to the peak, the mountain is a popular destination among amateur climbers. Mount Ophir is also the 64th highest mountain in Malaysia and arguably the most climbed mountain in the country. In the 14th Century, the Chinese seafarers plying the Straits of Malacca called it Kim Sua meaning the 'golden mountain', possibly from the Hokkien or Taiwanese words: kim, or in characters 金 meaning gold and sua, or 山 meaning mountain . Here's the our members favorite photos of "Peaks or Summits in Johor". Upload your photo of Mount Ophir!